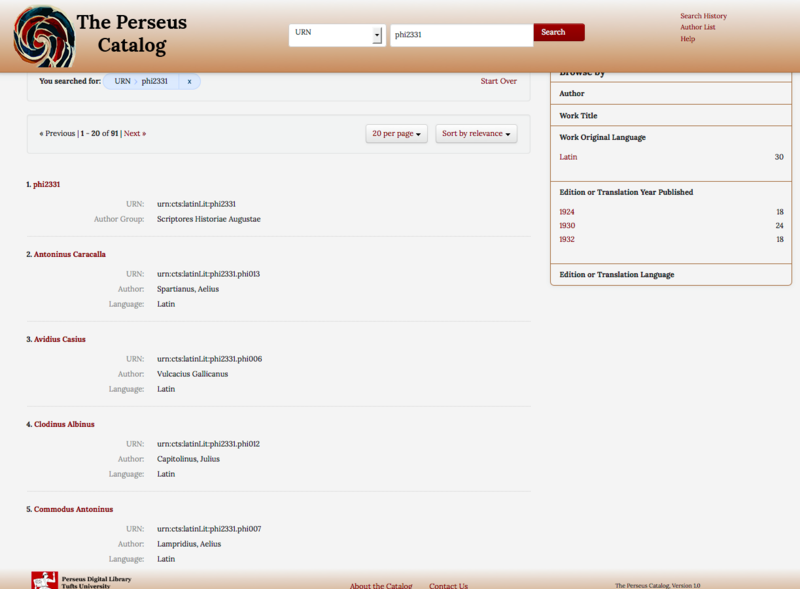 When on the home page of the Perseus Catalog, the right hand sidebar offers number of ways to browse the catalog. 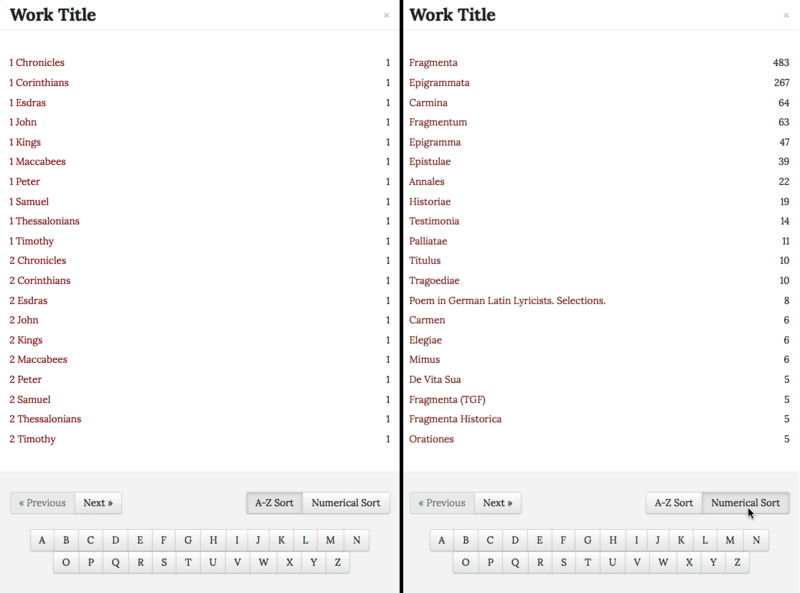 As you mouse over the various options, the table cells in the browser will change to a darker shade of gray. 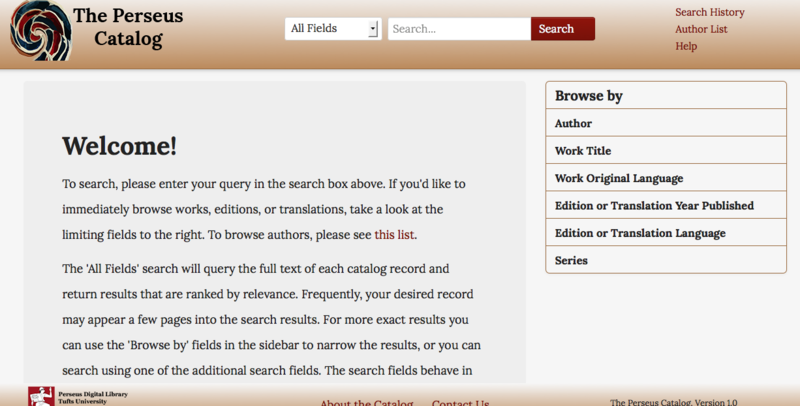 After a search has been completed, the contents of the browser (the Browse by menu) will reflect the results of that search. This browsing feature helps further narrow search results. 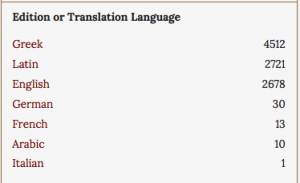 The list can then be browsed alphabetically using the “Next” button. The user can also jump ahead to another letter of the alphabet, or the list can be resorted numerically by the number of works cataloged for an author. 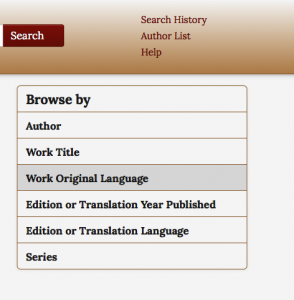 Clicking here presents an alphabetical list of work titles (but due to the indexing software presents numeric options first along with a few errors). Clicking on the “more>>” link at the bottom of the list presents the sorting options as detailed above. 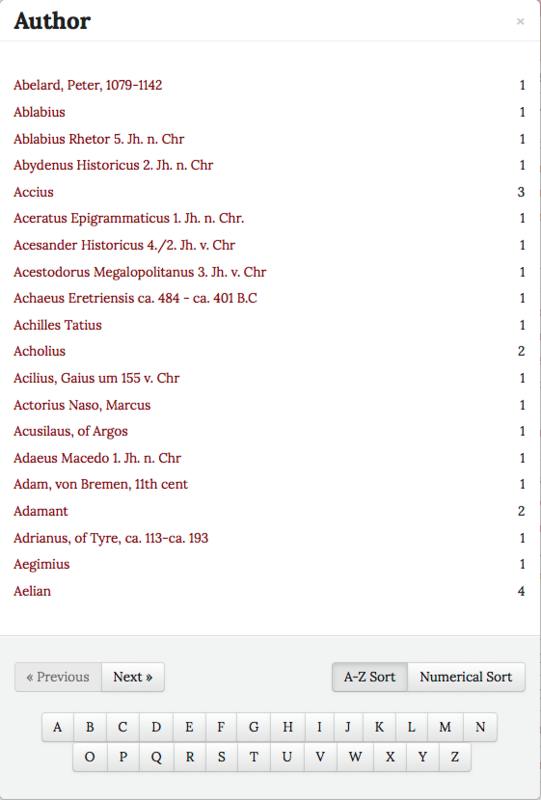 The list can then be browsed alphabetically, the user can jump ahead to another letter of the alphabet, or the list can be resorted numerically by the number of works that have a particular title (such as Fragmenta, Epigrammata, etc). 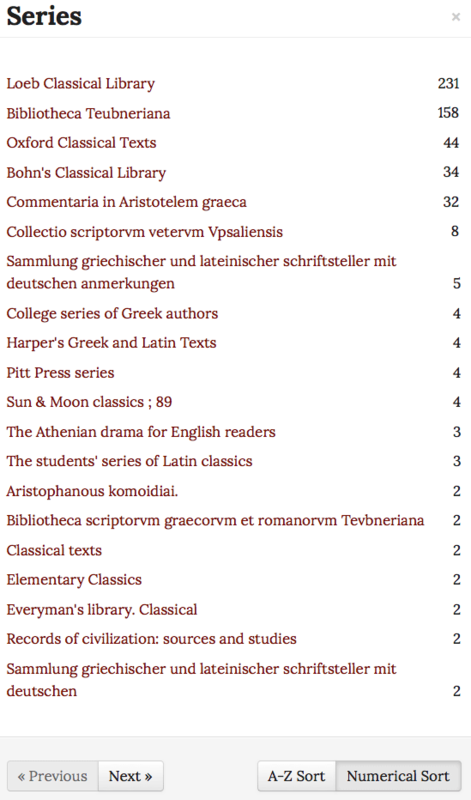 This link presents the user the option to browse an entire list of Greek or Latin works in the catalog. Clicking on “Next” allows the user to move forward chronologically by year. 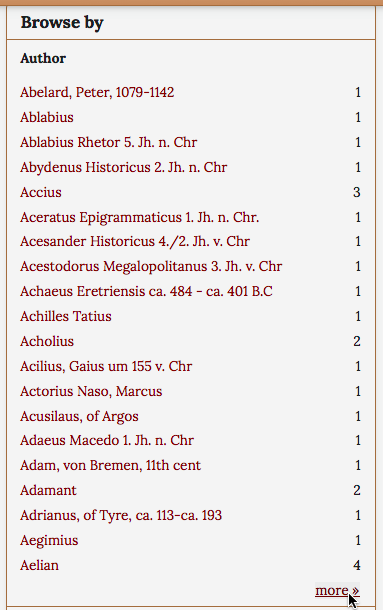 A-Z sort is a chronological sort from earliest date to most recent. 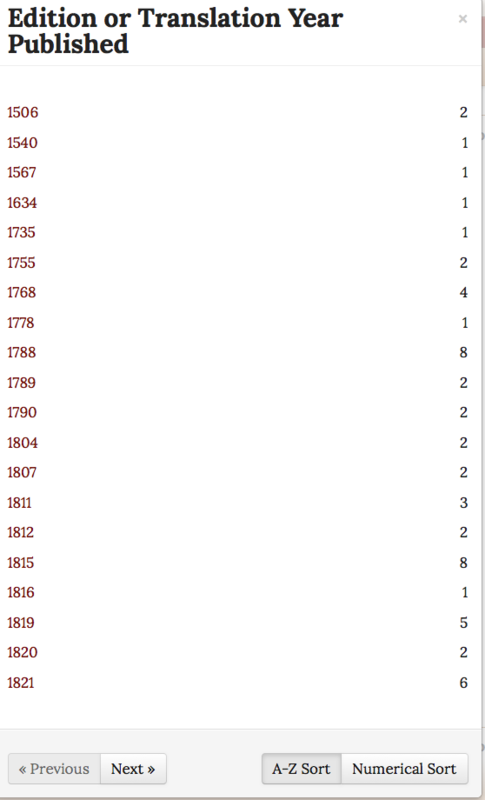 The numerical sort enables sorting by the years with the most editions or translations published. Clicking here presents a list of languages for editions or translations of works that have been cataloged that the user can select to browse the catalog. 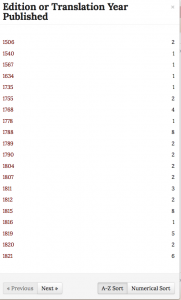 The list can be sorted alphabetically by series name as well.